A fun camping game that lets you do everything but salute your shorts. 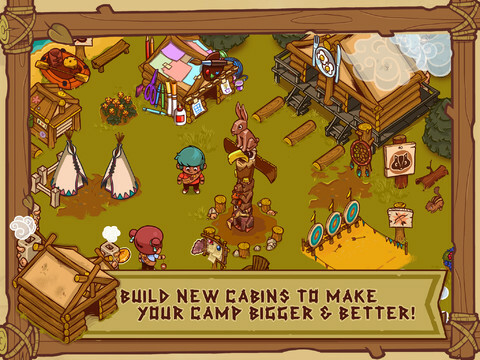 You don't need to love the great outdoors to enjoy Campers!, the latest free-to-play iOS and Android effort from Glu. Created with kids in mind, this lighthearted title recreates the joys (and some of the dangers, like poison ivy) of camping, giving players a chance to earn badges, go on adventures and build things to help expand and personalize their camps. There's a lot to like, a lack of real mosquito bites for starters, but a couple issues left us scratching our heads, starting with the controls. Campers! puts you in control of different youngsters, and it's your job to help them get the most from this virtual experience. 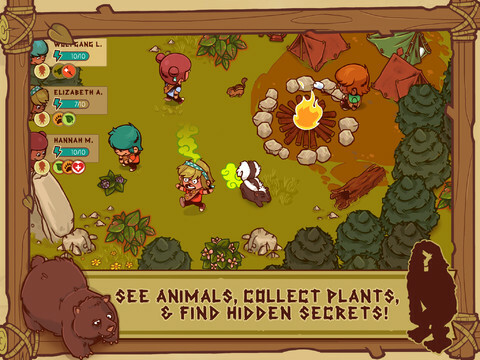 Throughout the course of the game, you'll send them on a variety of trips where they'll perform numerous tasks, like gathering acorns or searching for specific types of animals. That said, you guide them through the world by drawing lines on screen, watching as they follow specific paths. However, you can only move one camper at a time, and it's easy to accidentally press the screen and erase the current line. On top of that, you can't tap items like gold coins to pick them up. Instead, you must sketch another path so that campers do the work. It's tedious, to say the least. There's also the matter of energy. Campers can only stay awake for so long before they crash and refuse to respond, whereupon which you have two options. Put them to bed for up to an hour, or purchase snacks using the game's other form of virtual currency, arrowheads. Of course, arrowheads are not easy to come by, and the best way to grab more is to buy some outright via in-app purchase. Bottom line, you don't want to cancel a trip (and lose the reward) because of camper fatigue. Ultimately, you have to keep up with their energy levels, and strike a balance between who gets to sleep and/or eat. A bit restrictive, but manageable. Otherwise, Campers! is good. After completing trips, you have the option of heading back to camp or staying behind to continue exploring. What's more, campers will make note of things in their journals, thereby earning badges and leveling up. You can even roast marshmallows over an open fire, or enjoy mini-games, like a fun rafting trip that plays like your typical endless runner. There's also a plethora of things to build that help strengthen the camp, from new log cabins that house more campers, to greenhouses, workshops and the infirmary. In addition, adding different pets to the camp add coin rewards; Glu naming the turtles Leonardo, Donatello, Michelangelo and Raphael was a nice touch. Problems aside, Campers! may become a favorite of enthusiasts looking to enjoy their favorite hobby indoors. The wealth of activities, animals to find and stuff to buy should keep players busy for quite some time. On that note, pitch a tent, grab some marshmallows and have fun "roughing it". What's Hot: Cartoon-style graphics, a variety of activities and trips, personalizing one's camp, inviting friends to visit, free-to-play. 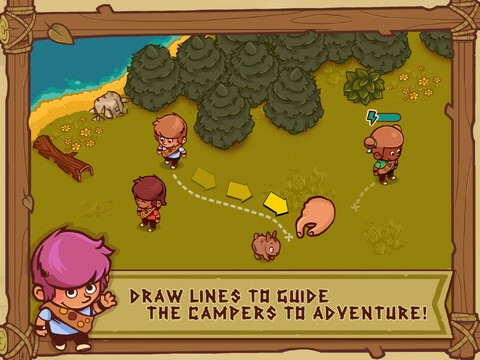 What's Not: Bothersome line-drawing mechanic, not being able to tap items to pick them up, campers get tired quickly.